Slice the eggplants into about 1/3″ discs. Sprinkle slices with a small pinch of coarse salt on each side and place in a single layer between two clean kitchen towels. Place a cookie sheet on top and weigh down with something heavy (a few cans of beans or tomatoes will do). Let the eggplant sit for 20 minutes. Lightly dredge the eggplant slices in the flour. Heat 1/4″ of olive oil in a large skillet over high heat. When a pinch of flour sizzles on contact, add the eggplant slices in a single layer, turn the heat to medium-high and cook for about one and a half minutes on each side or until dark golden brown. Drain the eggplant on paper towels and repeat in batches until all of your eggplant is cooked, adding more oil as necessary. 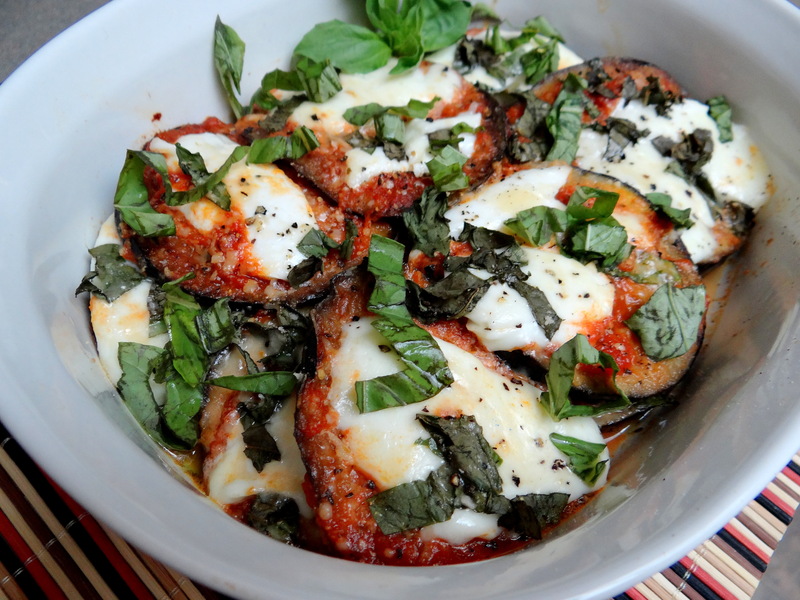 In a 13″ x 9″ baking dish, arrange as many slices of eggplant as can fit snugly in a single layer. Top each slice with a small spoonful of tomato sauce, a few small pieces of torn mozzarella, a bit of basil and a dusting of parmesan. Continue the layers, evenly distributing all the ingredients, until everything is used up. Bake for 25 to 30 minutes or until the cheese is melting and bubbling and the house smells divine. This is the way a true Italian makes eggplant parmigiano. Try it without baking like a casserole. Just spoon the tomato sauce over the fried eggplant and spindle with the parmigiano and basil . Yum! !